The rooftops at Lady Cilento Children’s Hospital in Brisbane, Australia, are as busy as the wards. Young patients reunite with their pets or take restorative strolls. Wheelchair rookies can practice on a purpose-built ramp. Kids shoot hoops or scale a climbing wall during the day, then settle on a grassy knoll to watch a movie at night. To find the sheer space needed for so many landscapes, managing director Bruce Wolfe and director Corbett Lyon gave their building a stepped structure, creating 11 roof sections. They’re replete with frond-filled vertical gardens. Colorful orchids and bromeliads also make appearances, poking fun at those who take the term “green space” too literally. Six 30-year-old fig trees, rescued from a residential development where they’d been earmarked for the dump, now flourish down on the plaza that fronts the hospital. 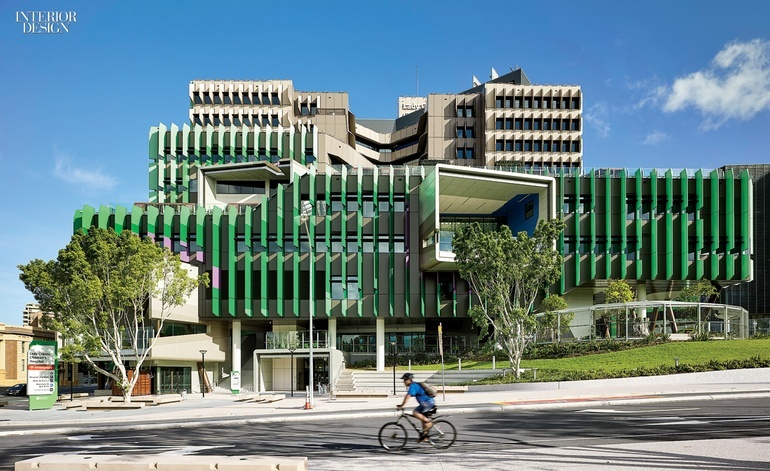 Beyond the facade’s postmodern-looking assemblage of bright green-painted aluminum fins and jutting steel frames, the 1.2 million square feet are organized like an abstracted tree. From two seven-story atria (trunks) in the center of the plan, double-height corridors (branches) extend toward window walls facing natural sights. They include the Brisbane River, D’Aguilar Range, and South Bank Parklands.